Gregory Isaacs is one of reggae music’s most distinguished singers. Famous as the “Cool Ruler” for his outstandingly smooth and moving voice, Isaacs recorded many successes during the 1970s and 80s, including the lasting favourite “Night Nurse”, and remained dynamic as a recording artist, live performer and producer in the decades that followed. Even though his best known for romantic ballads, delivered with an insinuation of helplessness, he also excelled at songs of social protest and work that expressed a resolute pride in his African heritage. 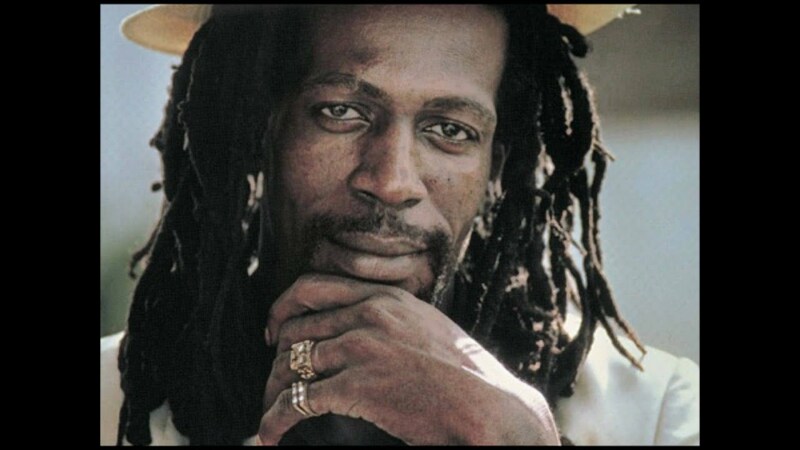 Gregory Anthony Isaacs was born in Kingston, Jamaica, on July 15 1951 and grew up in the poor neighbourhood of Denham Town. As a boy, Gregory was inspired by American soul artists such as Sam Cooke and Ben E King, by local acts and, above all, by the singing of his mother (whom his father abandoned when Gregory was a child). Encouraged by his peers at school and his teacher, he entered talent contests and soon became involved in the music industry, making his first (self-produced) recording in 1968; a duet with Winston Sinclair called “Another Heartache”. After a brief period as part of a Motown-style trio named The Concords, who split in 1970, Isaacs launched his solo career. He founded African Museum with the singer Errol Dunkley, and had his first significant success with “My Only Lover”, often labelled the exemplary “lovers’ rock” song. By the late 1970s, Isaacs was one of Jamaica’s major stars and frequently touring the United States and Britain. His casting as a street hustler in the 1978 movie Rockers aided to create the outlaw persona that would lead him later to claim of having been arrested more than 50 times. Mainstream success, however, did not come until the 1982 album Night Nurse. The cheekily suggestive title track reached only number 32 in the UK charts, but it was a huge underground and club hit. But just when Isaacs might have capitalised on his biggest hit, he become caught in drug dealing and consumption, and found himself serving a six-month sentence in a Kingston jail. He returned in 1988 with the digital dance hall-era hit “Rumours”, one result of a fruitful period of collaboration with the producer Gussie Clark, and continued to record up to three albums a year during the last two decades of his life, appearing at festivals such as Jamaica’s Reggae Sunsplash and the Notting Hill Carnival as a respected if somewhat weakened elder statesman of Jamaican music. Nevertheless, he kept a faithful fan base, both at home in Jamaica and overseas. Anthony Rodney was born to Edward and Pauline Rodney in Georgetown, Guyana on March 23, 1942. He developed into an intellectual and scholar and is recognized as one of the Caribbean’s most brilliant minds. Rodney combined his scholarship with activism and became a voice for the under-represented and disenfranchised – this distinguished him from his academic colleagues. His interest in the struggles of the working class began at a young age with an introduction to politics by his father, and continued with his involvement in debating and study groups throughout his student years. His PhD thesis illustrated his duality as an intellectual and activist as he challenged the prevailing assumptions about African history and put forth his own ideas and models for analyzing the history of oppressed peoples. Influenced by the Black Power Movement in the U.S., third world revolutionaries and Marxist theory, Rodney began to actively challenge the status quo. In 1968, while a UWI professor in Jamaica, he joined others to object to the socio-economic and political direction of the government. Unlike his counterparts, however, Rodney involved the working class, including the Rastafarians (one of Jamaica’s most marginalized groups) in this dialogue. His speeches and lectures to these groups were published as Grounding with My Brothers, and became central to the Caribbean Black Power Movement. Rodney’s activities attracted the Jamaican government’s attention and after attending the 1968 Black Writers’ Conference in Montreal, Canada he was banned from re-entering the country. This decision was to have profound repercussions, sparking widespread unrest in Kingston. In 1974, Walter returned to Guyana to take up an appointment as Professor of History at the University of Guyana, but the government rescinded the appointment. But Rodney remained in Guyana, joined the newly formed political group, the Working People’s Alliance. Between 1974 and 1979, he emerged as the leading figure in the resistance movement against the increasingly authoritarian PNC government. He gave public and private talks all over the country that served to engender a new political consciousness in the country. During this period he developed his ideas on the self-emancipation of the working people, People’s Power, and multiracial democracy. As the WPA gained popularity and momentum, the PNC began a campaign of harassment including police raids, house searches, and beatings. On July 11, 1979, Walter, together with seven others, was arrested following the burning down of two government offices. Rodney and four others (known as the “Referendum Five”) faced trumped-up charges of arson, but without proof and scrutiny from international supporters, the government was forced to drop these charges. Rodney’s voice was not confined to Africa and the Caribbean but was also heard in the U.S. and Europe. In the early-mid 1970s, he participated in discussions and lectures with the African Heritage Studies Association at Howard University; the Institute of the Black World in Atlanta, GA; the African Studies and Research Center at Cornell University; and the State University of New York at Binghamton. The persecution, however, continued: two party members were killed, and the government denied Rodney and others permission to travel. Despite this, Rodney continued his political work and attended Zimbabwe’s independence celebrations in May 1980. On Friday, June 13, 1980, Walter Anthony Rodney was assassinated by a bomb in Georgetown, Guyana. He was 38 years old. Premiering one year after the release of Shaft and one year before Bob Marley and the Wailers’Catch a Fire dropped, Perry Henzell’s The Harder They Come (1972) combined blaxploitation fantasies with developing-world realities and in the process, brought reggae music to the world. The first feature-length film from Jamaica—which at the time of THTC‘s release had been an independent country for only 10 years after three centuries of British rule—Henzell’s debut, being shown in a restored 35mm print at the IFC Center, is the definitive postcolonial cult-movie musical. Raw and rough, The Harder They Come mixes vérité footage of Kingston privation (shacks, shanties) and exultation (rapt moviegoers taking in a western, swaying-to-the-spirit church attendees) with a rude-boy bildungsroman. Henzell, who was born to a plantocratic white family in Jamaica’s north coast in 1936, and his co-writer, Trevor Rhone, a playwright instrumental in shaping the island’s indigenous theater, based the story on an actual cult hero: Ivanhoe “Rhygin” Martin, a prison escapee known as the “Jamaican Dillinger” who was shot dead by the police in 1948. Played by Jimmy Cliff, who had released four albums by the time of his acting debut in THTC, Ivan is introduced as a naif on a bus headed to his mother’s house in Kingston with a mango and news of a death in the family. Although the bumpkin—often addressed as “Country Boy”—is robbed of everything within his first hours in the capital, he still holds out hope he can make it big as a singer. He soon finds work doing odd jobs for a preacher—and acquires a new nickname. Peacocking in apple caps, skintight tees, elaborately patterned rayon shirts, and snug, pinstriped trousers (Cliff’s sartorial style in the film is almost as iconic as its soundtrack, electrifying nuggets made by various artists between 1967 and 1972), Ivan now answers to “Pretty Boy,” and he can’t help but wear down the resistance of the minister’s chaste ward, Elsa (Janet Bartley). Ivan takes off with Elsa and finally persuades the corrupt music tycoon Hilton (Bob Charlton) to give him some time in the recording studio. His single—the film’s infectious, mercenary title track (“So as sure as the sun will shine/I’m gonna get my share now of what’s mine”)—becomes a smash, for which Ivan receives only $20. “Who’s makin’ all the money?” he asks after being stiffed once again during his short career as a pot dealer. Gunning down some cops—many involved in the ganja trade—Ivan lams it, his record in constant rotation, and his legend sealed. There are almost no white faces in THTC, yet the dysfunctional legacy of 300-plus years of colonial rule is present in every frame. “I AM HERE I AM EVERYWHERE” reads the graffiti Ivan has sprayed to torment his pursuers—a tag that endears him to those powerless to fight against endemic corruption. 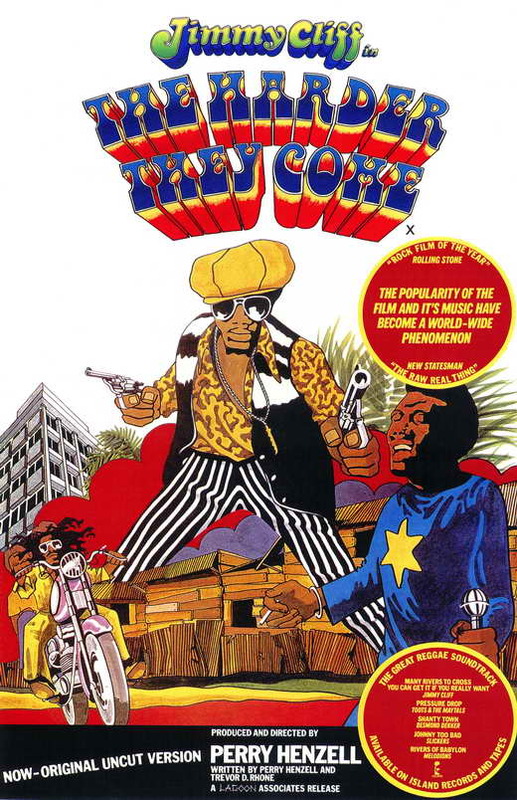 The Harder They Come debuted the same year that Jamaicans had just voted out the conservative Jamaica Labour Party, but civil war between the JLP and the left-leaning People’s National Party would erupt shortly after. Henzell would make only one other film: the tourist-board-friendly No Place Like Home (2006), which premiered in Jamaica the day after his death. That project’s softness reflected the dilution of the music that his first film had been so instrumental in exporting.